Schwarz Etienne is a Swiss watch brand whose origins go back to 1902 when Paul Arthur Schwarz and his wife Olga Etienne created a watch and movement factory at La Chaux-de-Fonds whose name combines their patronymics. Originally, the family company worked primarily for the different brands in its possession, such as Venus, Alpha... Today, it is one of the few watch companies to fully manufacture its watches, movements and components, including its regulating organ, the pendulum, in-house. Schwarz Etienne is pleased to unveil its inaugural ladies timepiece: the FIJI Floral Seconds. The FIJI Floral Seconds is endowed with an automatic movement (ASE 200.00). The watch is available in two dial colours and an animated floral display. The La Chaux-de-fonds collection celebrates the know-how of Schwarz Etienne in the production of complicated watches - emblematic of traditional expertise and a culture of innovation, it embodies the quintessence of Swiss haute horlogerie. With the Flying Tourbillons La Chaux-de-Fonds TSE 121.00, the Schwarz Etienne manufacture invites to a journey without borders or limits. Roswell Voyage is bold watch that refuses to comply with established forms....Now it's time to continue the expedition into the heart of the Swiss Alps, with a timepiece like no other. Roswell is a sophisticated watch, with an innovative design that cannot be confined within established forms. 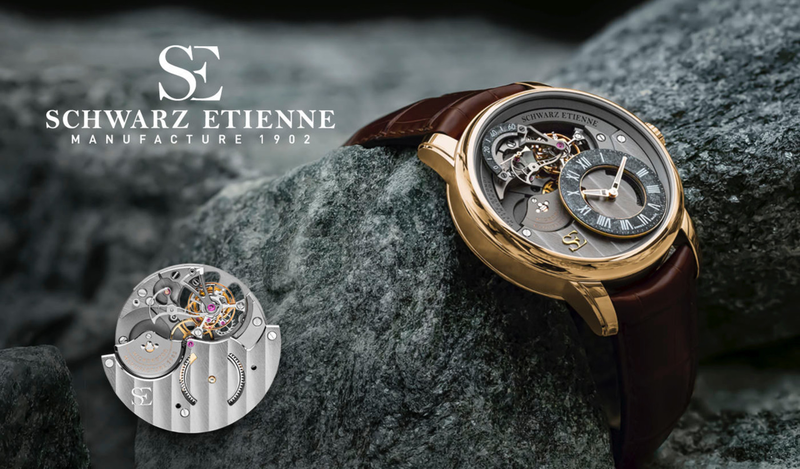 With a unique manufacturing movement, ISE (Irreversible Schwarz Etienne). The Roswell’s lines garantee that it will be recognised at first sight. The discreet and timeless elegance of classical watchmaking is at the hallmark of the Roma collection - defined by the purity of its lignes, extreme attention to detail and mechanical excellence.